The 1965 edition of FAO's annual publication, The state of food and agriculture, presents a review of the second postwar decade. Some extracts about forestry development are given here. · During the last decade forest policies in many countries have been more clearly defined and have increasingly been expressed quantitatively in the form of plans and programs. The concept of the forestry sector itself has been considerably enlarged. It has become generally accepted that forest resources and forest industries must be planned and developed in conjunction. It has also been recognized that forestry must be integrated with the other sectors of the economy, with respect both to the role of forests in land use and to that of forestry production, industry and trade in the economy as a whole. In many countries there have been substantial changes in the objectives of forest policy or in the relative importance accorded to these objectives. This has been due to such factors as the impact of urbanization, industrialization, expanded communications and the increased demand for leisure space in developed countries; the growing pressure on the land and the changing pattern of agricultural land use in the developing countries; and, above all, the sharp rise in demand for forest products. In the early postwar years the main emphasis was on wood production, and priority was given to the improvement of existing forests, afforestation and transport. After the immediate postwar period, more attention was devoted to forest conservation problems and to the role of the forest in soil and water conservation. During the last few years there has been growing awareness of the multiple role of the forest, particularly for recreation and leisure. Especially in the developing countries there has been a shift of emphasis from forest resources conservation to forest resources planning and management. This has resulted from the expanded use of all the products and services provided by the forests and from the growing pressure on forest lands. There is also growing appreciation of the role of forest industries in economic development. A major consequence has been a renewed emphasis on wood production. Plantations of quick growing species are being expanded rapidly as the basis for forest industries, and efforts made to realize the potentialities of the heterogeneous tropical forests. Transport is coming to be recognized as a key factor in the improvement of the forestry sector in most of the developing countries. The consideration of regional and world trends in forest products supplies and requirements, with their implications for international trade, has begun to exert a major influence on forestry planning. The study of European timber trends and prospects, published in 1954, has been followed by a new appraisal up to 1975 and by a series of similar studies for the developing regions. These studies have made possible a much more systematic approach to forest policy and development. The progress achieved in formulating and implementing national forest plans and policies has varied considerably in different parts of the world. In the developed countries, in view of the prospects for a further rise in demand for industrial wood, major emphasis has been placed on increasing forest productivity. In Europe, growing industrialization and urbanization and the changing pattern of agriculture have resulted in a great deal of attention being paid by public authorities to the physical and social roles of the forest. Considerable forest areas have been lost, mainly to housing and industry, but afforestation has progressed, partly with the abandonment of marginal farm lands. On the whole, timber supply has been the main objective of forest policy in Europe during the decade. The European countries now envisage a fundamental reappraisal of their forest policies in order to raise forest output, but a gap is foreseen which by 1975 may be of the order of 40 to 70 million cubic meters, depending on the rate of economic growth achieved. In the U.S.S.R., the forests are one of the greatest natural assets, and particularly since the start of the industrialization drive they have played an important role in economic growth. The U.S.S.R.'s forest policy is based on large-scale afforestation in the south and the utilization of untapped forests in the north and east, where big wood-industry combines with mechanical and chemical processing units, including pulp and paper industries, have been established. The sixth five-year plan included provisions for massive forest restoration and expansion operations, including improvement of natural forests, afforestation with fast-growing species, and the establishment of shelterbelts on land belonging to the kolkhozes. During the past few years, attention has been concentrated on the integration of forest operations and forest industries, together with the mechanization and expansion of the forest road network, so as to increase and rationalize the harvesting and processing of wood. Japan has introduced a national forest plan which is revised periodically on the basis of consumption forecasts. Basic forest legislation has recently been enacted which gives special attention to private forestry and human factors, and lays particular emphasis on forest productivity. Australia and New Zealand have carried out studies of their long-term wood requirements which form the basis for forest policy decisions. The aim of the Australian forest policy is self-sufficiency in wood, and an expanded planting program is under consideration. The New Zealand forest policy, on the other hand, aims at a considerable expansion of the country's steadily increasing exports of forest products. In the United States, progress in developing outdoor recreation has highlighted the activities connected with the multiple use of the forest during the last few years, but all forest products and services are in greater demand owing to the pressures of an expanding economy and a growing population. In Canada, the Forest Act has been revised and a central Department of Forestry, headed by a Minister of Forestry, has been established. Forest research institutions have been considerably expanded and federal-provincial co-operation in the field of forestry has been promoted. 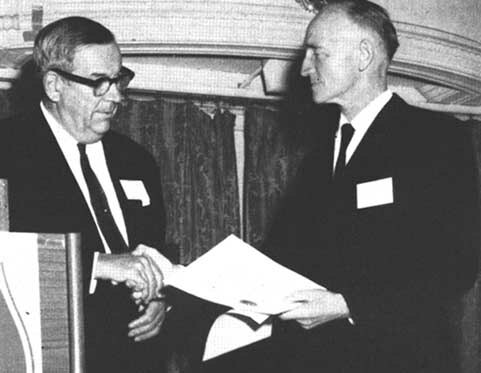 PHILIP A. BRIEGLEB, President of the Society of American Foresters, awarding a certificate of Honorary Membership to Nils A. Osara, Director of FAO's Forestry and Forest Products Division, during the 1965 Annual Meeting of the Society at Detroit, Michigan. Several countries in Africa have introduced new forest policies and legislation during the decade, but many of the measures adopted have not been fully implemented, mainly because of the lack of qualified staff. A related problem is the inadequacy of forestry research; many silvicultural questions concerning the African forests still remain unanswered and only a small percentage of the forest species is used commercially. Paper production has attracted particular attention owing to the heavy imports of paper. The technical problems of the utilization of mixed African woods for paper manufacture have been solved in some countries, but the investment capital required for the establishment of industries on a competitive basis has not yet been forthcoming. Reforestation has continued through the decade, but on too small a scale to meet the future needs of the region, and with few exceptions little attention has been paid to production for the export market. Increased interest has been taken in plantations of fast-growing species, but more attention has been devoted to exotic species than to indigenous ones, the possibilities of which still remain largely unexplored. Wildlife management has also retained the attention of various African governments, and basic laws have been adopted in several countries as regards bunting and the protection of nature. In the Far East, the past decade has in general been a period of considerable progress in forestry and forest industries development, the major limiting factors being the insufficiency of funds for investment and, to some extent, of qualified personnel. Forest policies have been increasingly integrated with landuse policies, and in many areas the importance of the forests' protective role has been fully recognized. Most countries have put into effect forestry development plans based on national wood consumption and production forecasts, but as yet the plans prepared by many of the wood-surplus countries fail to give sufficient weight to the opportunities for forestry industries development and for increased foreign trade, particularly within the region. Because of the disadvantages of the heterogeneous natural tropical forests as a basis for raw material supply, interest has centered increasingly on the establishment of quick-growing plantations, together with the long-range planning of forest industries development. In China (Mainland), the first forestry program specifically based on resource assessment was set out in a perspective plan for agriculture covering the years 1956-67 (later revised to 1959-68). The program assumed total existing reserves of 5,400 million cubic meters. Annual requirements (in cubic meters) for industrial wood were estimated to rise from 47 million in 1962 to 75 million in 1967, and 118 million in 1972. Some 105 million hectares were to be afforested within the plan period, to give a forest cover of 20 percent of total land area. The present policy is to devote about half of the planting area to economic plantations of fast-growing species, concentrated mainly in areas south of the Yangtse river. By 1960 the results of poor establishment practices in the new forests had become apparent, and measures were adopted to raise standards, while much emphasis has also been placed on the maintenance of existing plantations and on the conservation of the remaining natural forest resources. In Latin America, there has been a growing awareness of the importance of forestry in land use, and the forestry aspects of land settlement and land reform increasingly affect the formulation and implementation of the region's forest policies. Numerous systematic inventories and preinvestment surveys of forest resources have been undertaken during the decade. However, the implementation of forestry development plans, based on a careful assessment of requirements and resources, has still lagged behind. Forest industrialization has progressed considerably, and much interest has centered on the development of projects for pulp, paper and board industries, with the aim of reducing imports. The need for stronger programs of afforestation, geared to forest industries development plans, is widely recognized. In some countries, considerable progress has been achieved in afforestation, particularly for industrial purposes. However, forest administrations are still lacking in personnel and funds, forest clearing still goes unchecked in many countries, and forest industries do not always seem to be planned to offset the continued increase in the region's adverse trade balance in forest products. In the Near East, there has been a growing awareness of the economic importance of forestry. A noteworthy result has been the acceptance by foresters and agriculturists alike of the need to integrate forestry with general land-use planning and agricultural development. The important role of forestry in protecting the scarce water resources of the region has thus gained wider recognition, particularly in connection with watershed management, erosion control, range management, and the protection of agricultural crops by means of windbreaks and shelterbelts.